Vietnamese prosecutors on Thursday (April 4, 2013) asked a court to impose a lenient sentence on a former soldier who fought off a government eviction from his farm, a move some say is meant to avoid angering a public fed up with land seizures and corrupt officials. Prosecutors proposed that Doan Van Vuon be sentenced to 5-6 years in prison for charges of attempted murder when he used explosives and weapons to stop security forces from seizing his farmland last year. A conviction for attempted murder in Vietnam carries a minimum sentence of 12 years in prison and a maximum sentence of death. Vuon, 50, and his family members used land mines and homemade shotguns to repel security forces who came to repossess their fish farm on Jan. 5, 2012. Four policemen and two soldiers suffered serious injuries during the clash. Vuon is being tried along with his brothers Doan Van Quy and Doan Van Sinh, and Sinh’s son Doan Van Ve, all of whom face the same charges. Prosecutors suggested that Quy receive up to 5 years in prison, Sinh receive up to 4 years, and Ve receive up to 2 1/2 years of probation. The four men have been incarcerated since authorities attempted to forcibly evict them from their farm in Hai Phong’s Tien Lang district. Prosecutors are also seeking up to 1 1/2 years of probation for Vuon’s wife Nguyen Thi Thuong and 2 years for Quy’s wife Pham Thi Bau. Both face charges of protesting during the eviction. 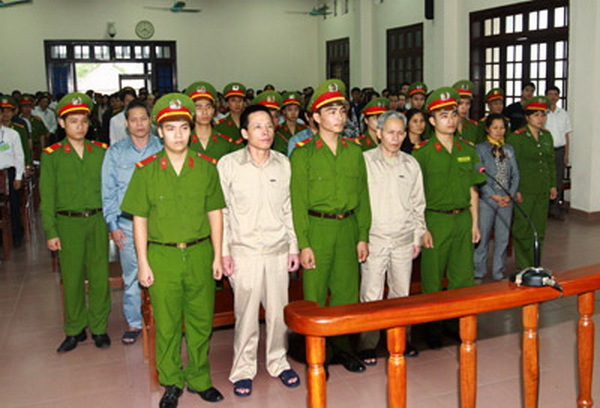 On day three of the four-day trial at the Hai Phong People’s Court in northern Vietnam, the prosecution said it had considered “mitigating circumstances” surrounding the incident while making their recommendations for sentencing. The court will make its decision in the case on Friday. Tran Vu Hai, an attorney who is following the case, told RFA’s Vietnamese Service that court prosecutors were “clearly under pressure from above and from the public” to lessen the proposed sentence, but still felt the need to show that the defendants are guilty. “That was why the proposed sentence was not severe enough to make people angry and largely to avoid protests by the public,” the lawyer said. Hai called the charges of attempted murder “inappropriate” and “irrelevant” because the prosecutors have no proof that the men had intended to kill anybody. Hai said that it was still unclear who had fired the first shot during last year’s confrontation because no independent offices, such as the Ministry of Police or prosecutor’s office, were involved in the investigation. He said that all of the judges involved in the case are members of the ruling Vietnamese Communist Party and must follow the orders of the Hai Phong Party Secretary, who is himself a police officer. “We will have to wait until tomorrow to find out how they will rule,” he said. Vuon’s trial has elicited widespread support for the former soldier-turned-folk hero and his family, both within Vietnam, where land disputes are a contentious issue, and from rights groups abroad. Scores of supporters traveled to the northern port city to protest the first day of Vuon’s trial, resulting in several detentions, participants said. “There had never been a case like this before … The source of all the wrongdoing is the local government, but they blame everything on the family,” he said. Another writer named Ha Si Phu called the sentence recommendations “surprising,” saying most people had predicted a severe punishment that would dissuade other farmers from rising up against the authorities. The trial also drew condemnation from rights groups abroad including Paris-based Vietnam Committee on Human Rights (VCHR) and Human Rights Watch (HRW) in New York. “The trial in Hai Phong shows the hypocrisy and fraudulence of both the judicial and political systems in Vietnam” said VCH President Vo Van Ai. Ai called on the trial judges to prove that they “are not mere tools of the Party and state” and acquit the family. Phil Robertson, Deputy Director of HRW’s Asia Division, said “the linked issues of land seizures and corrupt officials, combined with a lack of due process and legality” was what really made Vuon’s trial resonate in the minds of ordinary Vietnamese people. “These events are an important warning sign to the Vietnamese government about what can happen when it lets its officials violate human rights with impunity,” he said.